This page is for individuals who want to improve their English writing skills. If you are self-employed and you need help with specific texts or documents, please visit the English good to go page. Do you never get round to improving your written English because you can’t find the time? Do you want personalised feedback that will help you improve your English writing skills? If you take part in the 10-week English writing challenge, I will send you 10 tasks that should each take 60 to 90 minutes to complete. You can complete them at a time that’s suitable for you and I’ll send you detailed, personalised feedback. I am a native English speaker and a qualified English teacher, specialising in business English. I have also worked as a Communications Manager, which involved working with native speakers to make sure that they could express themselves clearly and effectively in writing. How does the writing challenge work? Each week you will be sent a document that gives details of the week’s task. Scroll down to see the types of writing that you will be asked to produce. You then type your text on the given topic and email it back to me. This method is different from what you may have experienced before. I won’t proofread the document and highlight every error. However, each week I will give you ten tips on how you can improve your writing skills. My written feedback will include explanations and examples and I will help you to improve your grammar, use of language, vocabulary and punctuation. If I comment on grammar, I will provide other examples to illustrate the point. You will then be able to focus on these ten points when you are doing your next task. In this way, the feedback becomes meaningful as you are using it directly to improve your writing skills. It is not overwhelming because you have 10 points on which to focus your attention. If the same mistakes aren’t repeated, over the ten-week course, you will receive 100 personalised tips on how you can improve your writing skills. If you want to take a break, for example for a holiday, just let me know and I won’t send you your next task until you’re back. Having a structured programme keeps you accountable and it also keeps you focused and motivated to do something each week. The feedback is relevant to your written work and you don’t have to sit through group training, going over information that you already know. You have ten reports to which you can refer in the future. This is easier than trying to remember what a teacher said or trying to make sense of notes that were written in a hurry. You don’t have to commit to being in a certain place at a certain time because you decide when you will complete the tasks. Even though you’re not attending training sessions, you’re still benefiting from a trainer reading your work and offering suggestions for improvement. 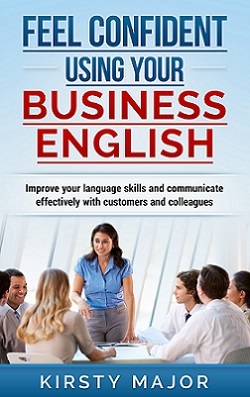 In some tasks you are given opportunities to practise English in a business context. You can develop your skills in a safe environment where you are not actually practising on your colleagues and customers. You can then use what you’ve learned in real-life situations. 2. Reporting on a past event (a holiday, a memorable day etc). 3. Writing to express dissatisfaction or resolve a problem (a letter of complaint). 4. Writing to finalise arrangements. 5. Creative or descriptive writing. 6. Writing a review (a concert, film or book review). 7. Writing to request something. 9. Factual writing (about a place, topic of interest or person). In most cases there will be several scenarios, so you can choose the one that would be easiest or most interesting for you. You have two options for the challenges. Option 1: you complete a five-week challenge for £100. You choose the five types of writing that are most relevant to you from the list above and you only do those tasks. Option 2: you complete the ten-week challenge. This costs £175. Alternatively, you can try out one module for £25. Paypal will calculate the conversion into British pounds for you and show you how much it would be in your local currency. If you have questions about the writing challenges or you would like to sign up, get in touch with me using the below contact form.